A wallet is one of those accessories you carry on a daily basis – you actually can’t do without it. Personally, if I don’t remember to carry my wallet to work, the entire day will be ruined for me; I mostly feel incomplete without one. If your current wallet has finally given in to the effects of wear and tear, and you urgently need one, you might want to consider asking yourself these questions before you make the important decision of buying the right one. i. How much money do you normally carry? I tend to carry lots of cash at any given time: If you always find yourself having lots of paper money, a bifold wallet or trifold wallet will suit your needs best. I carry very little money: If you just carry little cash when going out, then you’ll certainly benefit from a Kinzd slim front pocket wallet. With this type of wallet, you can fold up a couple of bills and keep your cards. The front pocket wallet helps by freeing up space in the pockets, which is a big win. ii. Do you travel a lot to international destinations? I actually travel often: Any man who frequently travels to various international destinations will definitely fall in love with the Euro and Pound Wallets. It is worth noting that Pound and Euro notes are generally bigger compared to the U.S. dollar bills. iii. How much wallet space would you typically need? I don’t carry a lot of items: If you carry only a few cards in your wallet or you wish to free up some space inside your pockets, a card case wallet will perfectly match your needs. This wallet presents you with a minimalist style by lightening your load while keeping your body posture healthy and even. iv. I need as many pockets in my wallets as possible: If you prefer to carry plenty of cards including bank cards, credit cards, loyalty cards, and more, then you might want to consider owning a wallet that has separate slots for all of your cards. In such a case, hipster wallet will suffice. Note that doubling up when storing cards actually wears them out over time. v. Are you more concerned about keeping your personal information safe at all times? Of course, we all hold dear our personal information: Since technological innovations keep advancing at a steady pace, you could easily be left behind if you fail to take the right measures. Thankfully, the use of RFID technology prevents the use of scanners from accessing personal information. Today, there are plenty of options you could choose from if you specifically wish to buy a wallet that integrates RFID technology. Will the material stand the test of time? A broad range of materials are actually used to produce wallets. Some of these include wood, nylon, fabric, plastic, and many more. However, the big question you need to ask yourself is: Will the material stand the test of time? Not all wallet types provide the same level of functionality. Even so, the material used in the construction of the wallet determines its durability and how it will age over time. • Harder materials including metal, plastic, and wood boast of a modern, sleek feel and look, but are prone to warping and failure. 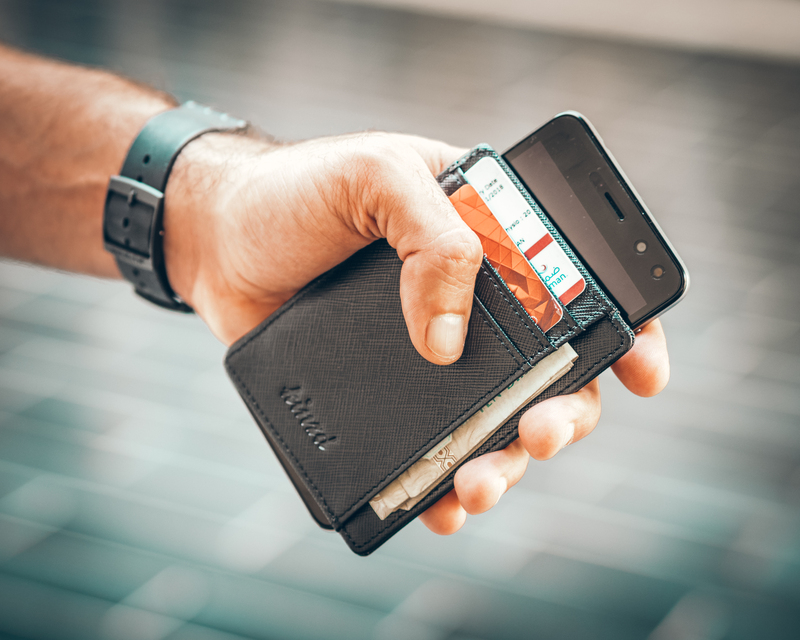 • Fabric wallets are extremely affordable but the daily wearing out of the wallet causes major destruction on the fabric faster than you would imagine. The construction of fabrics involves weaving strands together to form the main fabric. Some are tightly woven, which makes them stronger. No matter the fabric quality, it will eventually wear away, thereby leading to fraying. As a result, the wallet slowly disintegrates and falls apart. We have been making quality leather wallets for more than 100 years and with this level of experience, we confidently confirm that that leather is undoubtedly the best material choice for making quality wallets that last many decades. When you need a wallet that will last many years, avoid the bonded leather and genuine leather variants. Bonded leather is produced by bonding many layers of leftover hides or scrap hides while genuine leather refers to a type of leather with the lowest quality. However, bonded and genuine leather options generally cost lower and suit some applications. Their lifespan is much less when you compare them to the high-quality grade leathers. Top Grain and Full Grin leathers are used to make the high-quality leather wallets. These leathers boast of thickness and characteristics, which make them capable of withstanding decades of use with proper care. The fact that most are stained prevents them from wearing fraying. At Bosca, we do things differently and after many years spent in the industry producing high-quality leather wallets, we have perfected the art of sourcing for leather, selecting, and processing different types of leathers. Our tanner in Italy sources most of our quality leather from numerous farms situated in Northern France. We painstakingly inspect our leather and grade every hide. Each one has to be perfect for our collection of numerous hand-stained Italian leathers including Washed, Dolce, and Old Leather. Our mantra: “Our products wear in, not out.” It is quite possible to utilize the best quality leather and fail spectacularly at the construction phase thus making expert craftsmanship the crucial link between the materials and the product. On many occasions, we see a good number of Bosca wallets we produced many decades ago that are still being used today. Since wallets have many layers, some can get bulky and heavy. However, to slim down a wallet while keeping it durable, we apply expert craftsmanship and highly innovative construction techniques. Splitting, a process applied in the thinning of leather is widely used to improve workability while trimming down the weight. Shaving off the leather excessively or starting with an excessively thin leather means the lifespan of the wallet is significantly shortened and it might begin wearing out sooner. Skiving is yet another process used to give wallets a thinner outline. It involves shaving off thin layers of leather at the edges. However, if skiving is done to the point that the leather is too thin, durability will be lost and it could easily rip at the points where needle and thread are used. To get it right, the specialists know just how much they need to shave off while maintaining the structural integrity of the wallet. Splitting leather is a technique Bosca often uses to ensure the appropriate thickness is achieved. We then skive off the edges and complete the turning process. Through turning, we make the leather pieces thinner. This allows for wrapping around an extra layer to make it three layers for holding the stitch in place. The result is a high-quality leather wallet that boasts of the right thickness, thereby guaranteeing longevity, a thinner wallet profile and a stronger, long-lasting stitch. Quality matters. If you choose to spend a little more cash now on your new wallet, you end up making significant savings later in the future. When you choose Bosca wallets, you can enjoy the products for many decades.